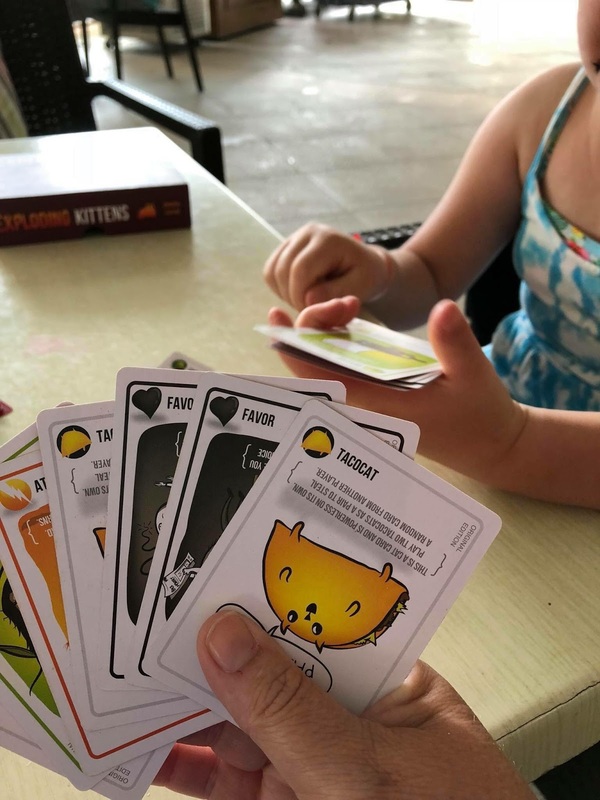 Miss Tilly And Me: What Is Exploding Kittens Game? What Is Exploding Kittens Game? This month we received two games from the Asmodee UK, Blogger Board Game Club. Both games were smaller and easy to pop in your bag to take away on your summer holiday this year. This game was a little difficult for Tilly to grasp because she has dyslexia and the cards weren't easy for her to read but I helped her out. Tilly is a bit of a cat fan, so this game was funny to her as you play it and wait for the exploding kitten! 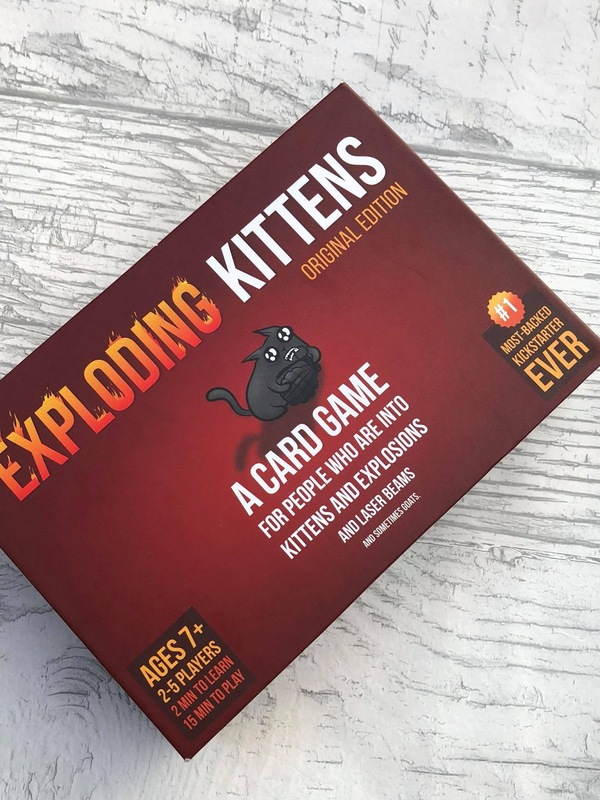 Exploding Kittens was actually a Kickstarter project that was backed by over 219,000 people. The game is like a kids version of Russian Roulette and you place an exploding kitten card in the pile and keep drawing cards until a player gets to the exploding kitten. 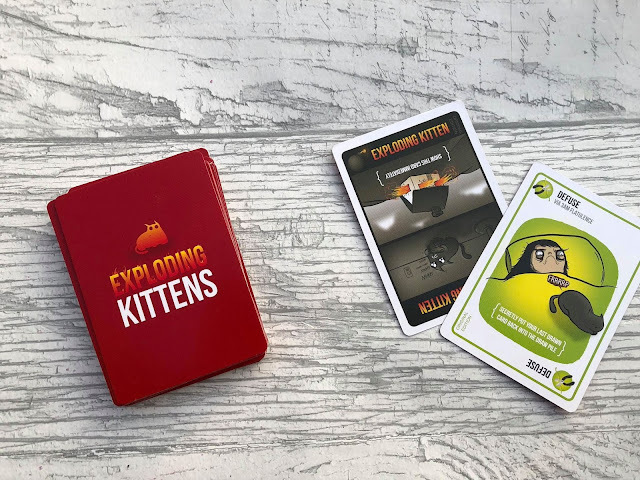 If you draw the exploding kitten, then your game is over unless you have a 'diffuse' card. If you have a diffuse card, you hand it over and slot the exploding kitten card back into the card pile. There are lots of different cards in the game that do little actions to help you play the game. You have to use these cards to your benefit. The game is about being sneaky! 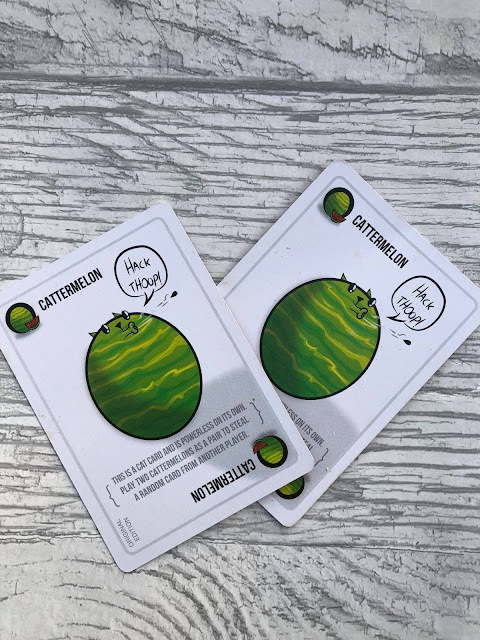 The benefit cards are Attack, which means you force your opponent to take two cards from the pile, hoping they get the exploding kitten. Skip, ends your turn and you can use this if someone uses an attack card against you. Favour forces the other player to give you a card of their choice (they could give you a rubbish card). Shuffle, gives you the opportunity to shake the game up a bit and shuffle the cards. See The Future card means you get to have a sneak peek at the top three cards on the pile. Then you know if the exploding kitten is close. There are also cards that are no good on their own and you need 2 of them to bring them in to play. If you get two of these cards, then you get to steal cards from the other player. The game is for people aged 7 and over (I guess because they have to read the cards) and it takes about 15 minutes to play a game. Its perfect for people like me with a short attention span! You can play with only two players, like me and Tilly or you can play with up to 5 players. It says on the box that it takes 2 minutes to learn but it took Tilly a bit longer to get to grips with the game. Exploding Kittens is available from Amazon for £19.70. This post may contain affiliate links, where we earn a little bit of cash if you click the link and buy it. thank you for your support.